Milwaukee Tools has been an industry leader in both durability and performance since their start in 1924. Milwaukee continues to offer innovative, trade-specific solutions with each of the power tools that they design and release. As an authorized Milwaukee Tools retailer, Tools Plus carries their Milwaukee M12, M12 Fuel, M18 and M18 Fuel cordless product lines. 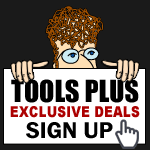 Tools Plus also offers an extensive selection of Milwaukee power tools, hand tools and combo kits which include: Milwaukee Sawzall, Hole-Hawg, Force Logic, impact drivers, drill sets, PACKOUT storage, tool backpack, and more. Milwaukee Tools knows that details make the difference with their professional users and that's why they pay attention to every detail that goes into their power tools.